Omnicom print and digital shop Novus has struck a deal with video sports platform Season to place upwards of $10 million in ads on many of its 500-plus sites. While the companies would not confirm that figure, that's the rough starting point, with spending to be adjusted over time, per sources. The deal is designed to help Novus clients reach sports fans in local markets in a scaled manner as Season reaches over 70 million U.S. consumers, according to comScore. In addition to spot inventory, the deal enables Novus to craft custom, market-specific programs via the platform. 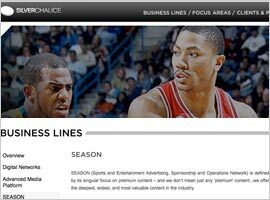 A unit of Silver Chalice Ventures, the Season platform streams official professional and college sports video highlights (from all leagues except the NFL) across 500 publisher sites -- from The New York Times to many regional, local dailies and weeklies via a syndicated video player. The content is ad-supported and free for consumers. Earlier this year, Novus -- once known primarily as a buyer of remnant newspaper space -- completed a major reorganization that included hiring new senior management and new resources designed to transform the agency into a local market retail and direct-response shop. Former Tribune executive David Murphy was hired as Novus CEO two years ago to oversee the transition. With annual billings estimated at $500 million, Novus said it would use the Season platform across its roster of clients, which include both marketers and other agencies that outsource print and related digital duties to the agency.